Wear is an evangelical Christian whose faith led him to seek justice and mercy in the world, and he sees that fulfilled through his work as a progressive Democrat. But he also longs to overcome polarization and find ways to work with conservative Republicans—including a candid assessment of our persistent disagreements—in order to move forward together toward the justice and mercy we all seek. The problem of polarization dominates the structure of Reclaiming Hope. After telling the fascinating story of how he got to the White House, the remainder of the book is structured not chronologically but around a series of political challenges—the Obamacare debate, gay marriage, and so on—defined by polarization. Some of the startling details in these chapters have dominated reviews and general attention surrounding the book. This is understandable. Wear relates hostility to faith (all faith) that he encountered from some other White House staff, flagrant bad faith on the part of some gay activists, and to some extent his own sense of betrayal over Obama’s handling of religious freedom and gay marriage. Thomas Nelson (2017). 304 pp. $25.99. In this unvarnished account of faith inside the world’s most powerful office, Michael Wear provides unprecedented insight into the highs and lows of working as a Christian in government. 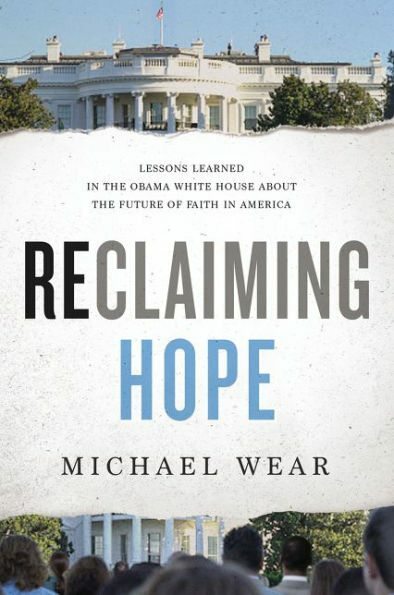 Reclaiming Hope is an insider’s view of the most controversial episodes of the Obama administration, from the president’s change of position on gay marriage and the transformation of religious freedom into a partisan idea, to the administration’s failure to find common ground on abortion and the bitter controversy over who would give the benediction at the 2012 inauguration. The book is also a passionate call for faith in the public square, particularly for Christians to see politics as a means of loving one’s neighbor and of pursuing justice for all. Engrossing, illuminating, and at time provocative, Reclaiming Hope changes the way we think about the relationship of politics and faith. humility—overcoming the domineering passions of the culture wars and seeking to be of real use to others rather than to be in charge of others. This book helped answer a question I and many others have long wrestled with: Why do people love Barack Obama? The admiration of Obama is hard to understand for those of us who have been on the receiving end of his untruths and broken promises, of IRS investigations designed to shut us down illegally, and many other abuses of power. We could see through the “hope and change,” “yes we can” nonsense; why didn’t they? Wear shows that Obama did exceptionally well one of the most important jobs we rely on our political leaders to do: use words to express publicly our national commitment to justice and mercy. One reason America is going south in a handbasket is because very, very few of our political leaders are able to do this well. For those who paid more attention to him than people like me did, Obama did this job masterfully. Wear’s defenses of Obama’s decisions are sometimes surprisingly persuasive. I didn’t expect to be convinced that it was good Christian prudence for the Obamas not to become members of a local church in Washington. I’m just about as militant a churchman as you’ll find, but I was persuaded by Wear’s case that a modern president brings through the door with him problems and complications sufficient to severely hamper the worship and community of any congregation he enters. At other times Wear does bend over too far backward to defend Obama. He’d have done better to forego the attempt to put lipstick on the pig of Obama’s “above my pay grade” excuses on abortion. And some of us remember the political battle over Obamacare quite differently than Wear does, in whose telling the Democrats were all reasonableness and compromise while the Republicans bear all blame for recalcitrance and betrayal. Wear’s argument for the positive role played by the National Prayer Breakfast also hasn’t aged well, as a new president has shown what a disaster it becomes in the wrong hands. Nonetheless, Wear is what the nation needs more of, because the nation can have no moral consensus—no shared basis for doing justice and mercy together—if religion is only welcome in one political party. And he’s what the church needs more of, because the church can’t effectively bear witness for justice and mercy—which it must do in order to preach a gospel of justice and mercy!—if all the faithful Christians are in one political party. My judgment that conservatism (to the small extent it’s still a meaningful word) is preferable to progressivism is far less important than the undeniable fact that what the nation and the church need most is a moral consensus that transcends polarization. What the nation and the church need most is a moral consensus that transcends polarization. Conservatives and progressives are both defined by their strong sense of alienation from the advanced modern life they see around them; both view modern life as morally empty. Progressives like Wear tend to believe our moral emptiness consists of insufficient concern for the well-being of those in greatest need. Conservatives tend to believe the moral emptiness of modern life consists of an excessive focus on people’s material circumstances as the measurement of their well-being, to the exclusion of personal virtue and authentic spiritual community. Both impulses become dysfunctional if pursued to an extreme, but both are necessary elements of any well-balanced understanding of what it means to do justice and mercy. The church and the nation must overcome our polarization so that all of us—on both sides of the aisle—will equally value the command to feed the hungry and the insistence that man does not live by bread alone. In the present circumstance, that means we need more people like Wear and more books like Reclaiming Hope.